You may not be going on safari, but with the Nissan Xterra, you will look the part. The rugged SUV combines utility with modern style, creating a more sophisticated, urban version of a rambler that could cut through jungles and plains in search of lions and other game. 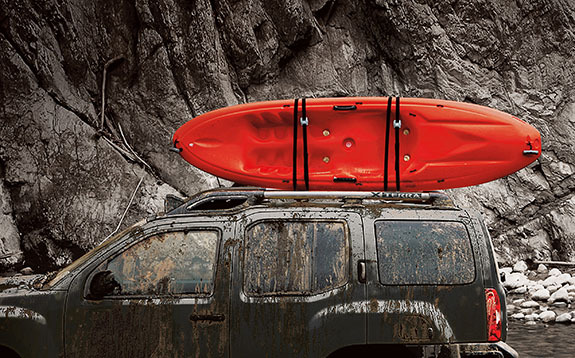 Of course, you don't have to be on the hunt to enjoy the 2015 Nissan Xterra. This comfortable SUV is perfect for families or even young professionals who want to impress clients during the week but enjoy some off-roading on the weekend. The 2015 Nissan Xterra is the total package, and it is available for an affordable price that will fit just about any budget. The 2015 Nissan Xterra is made for roaming. In it, you can go just about anywhere you want to go. The engine is powerful, and the platform has been designed to handle rough terrain. Only one engine option is available for the Xterra: a 4.0-liter V6 engine that puts out 261 horsepower and 281 pounds per feet of torque. That's enough power to haul whatever cargo you need for your next camping trip or hike or to pull a boat to the cabin. You can also pull a trailer or even a small camper. You may not be able to go from 0 to 60 mph in 2 seconds or reach race track speeds in the Xterra, but you will enjoy more power under the hood than most mid-level models offer. The continuously variable valve timing provides an on-demand boost when you need it. The base model comes with rear-wheel drive, but you can upgrade to the PRO4X model for four-wheel drive. You can also choose four-wheel drive as an add-on for the base X and S models. With four-wheel drive, you'll have the power to cut through muddy, rocky, sandy and icy terrain. The body-on-frame platform includes a number of other features that make the Xterra off-roading friendly. The body has a 9.5-inch ground clearance, giving it ample room for bouncing over rocks and ragged pathways. The stiff suspension, responsive steering and large tires make handling the Xterra easy even over the roughest of trails. The 2015 Nissan Xterra is a versatile performer that will deliver on country trails as well as it does city streets. The Xterra's flexibility helps you save money by giving you one vehicle that will do everything you need it to do. You don't have to give up comfort for power with the 2015 Nissan Xterra. Even when you're bouncing over rocks and slushing through creeks, you'll feel comfortable in the large cabin. The high roof leaves plenty of head room -- as well as a little extra for those times you will inevitably hit a bump or two on the trail. The large windshield provides great views of the wilderness, and the theater-style seating ensures that even those in the back seat get a good view. The interior isn't covered with lush fabrics, but it does straddle the line between comfort and utility. The upholstery is tough enough to stand up to the wear and tear of carrying plenty of cargo and gear, but it is also comfortable. Interior features include a driver's seat that can be adjusted for height and lumbar support, rear ventilation ducts, cruise control, remote keyless entry, steering-wheel-mounted controls, a six-speaker audio system and a navigation system. 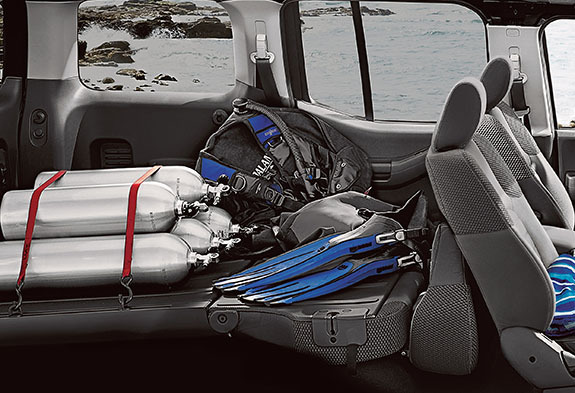 Contributing to both the comfort and utility of the 2015 Nissan Xterra is the exceptional cargo space. With more cargo space, you also have more passenger space, enhancing your comfort. The additional cargo space also makes it easier to carry whatever you need for camping trips, a day on the lake, or even shuttling your kids to soccer and softball. The second row folds down flat so you can turn the entire rear end of the Xterra into cargo space. The seats fold 60/40, so you can still leave room for a rear passenger if you have to haul a larger item, like a long piece of lumber or some sporting gear. Numerous storage compartments are located throughout the cabin, including a double glove box, a large console between the seats, and a storage area under the floors. Of course, there is also a large cargo area behind the seats, offering 35 cubic feet of space for gear. There is also a roof rack for carrying luggage, kayaks and other sports equipment. There are three versions available for the 2015 Nissan Xterra -- the base X model, the S model and the PRO-4X. All three versions feature the same drive train but come with different options. The S model features upgrades like 16-inch alloy wheels, a cargo channel system, an easy-clean cargo area, and the Nissanconnect system with a variety of mobile apps for information and entertainment. The PRO-4X model includes upgrades like Blistein shock absorbers made especially for off-road performance, off-road lights mounted on the roof rack, hill start assist, and hill descent control. The PRO-4X model is designed with even more off-road features for those who want to push their Xterra to its limits. The base X model starts at an affordable $23,660. The mid-level S model starts at $25,670, and the fully stocked PRO-4X model starts at $30,590. Even the premium model is affordable for most families. You would pay much more for the same power and perks in another vehicle model. The 2015 Nissan Xterra is a versatile vehicle that offers a little bit of something for everyone. It can serve as a nice-sized family vehicle that will drive safely through snow and rain, or it can be your vehicle for weekend fun, going camping and off-roading. The affordable price tag puts it within range for most buyers, and leasing options are just as affordable.